Follow straight through 2 sets of lights. When coming downhill on Main Street to the center of town, take a right immediately after a new office building (77 Main St) and immediately before the Fire Department (73 Main Street). Go straight into the parking lot, and Carrigan Park will be up on your right. Carrigan Park is directly behind 79 Main Street, but you must use the parking lot behind 77 Main Street. Carrigan1 Field is closest to the street (field with lights). Carrigan 2 Field is furthest from the street (field without lights). Colella Field is located at EMC Park on Hayden Rowe Street in Hopkinton. The entrance of EMC Park is across from Hilltop Road. When you enter EMC Park, there is a playground on the right, and three fields on the left. As you enter the parking lot, Colella field is on the left (about 100 yards away from lot). 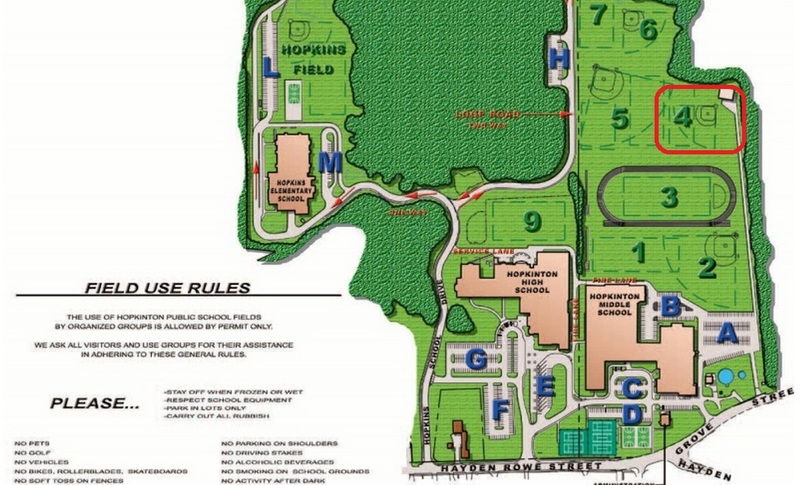 OVERFLOW parking for EMC Park is at Hopkinton High School, NOT Hopkinton Center for the Arts. Egan Field is located in EMC Park on Hayden Rowe Street in Hopkinton. The entrance of EMC Park is across from Hilltop Road. When you enter EMC Park, there is a playground on the right, and three fields on the left. As you enter the parking lot, Egan Field is all the way at the other end, past the concession stand. McIntyre Field is located in EMC Park on Hayden Rowe Street in Hopkinton. The entrance of EMC Park is across from Hilltop Road. When you enter EMC Park, there is a playground on the right, and three fields on the left. McIntyre Field is located on the immediate left as you enter the parking lot. It is located between Colella Field and Egan Field. From the center of town head west on Rt. 135 towards Westboro. Continue on Rte. 135 for 2.4 miles, then take a right onto Fruit Street. Follow Fruit Street for 0.4 mile until you see a baseball field on the right. Just past the ball field, take a right onto a gravel road to reach the fields where the sign says "Garner Bros Saw Mill". Directions from I-495: Take exit 21A toward West Main Street in Hopkinton. Stay on West Main Street for about a mile, then take a sharp left at the lights onto Rte. 135. Stay on Rte. 135 for about 2.4 miles, then take a right onto Fruit Street. Follow Fruit Street for 0.4 mile until you see a baseball field on the right. Just past the ball field, take a right onto a gravel road to reach the fields where the sign says "Garner Bros Saw Mill".